A deadly, icy polar vortex continues to blast the Northeast and Midwest, causing at least 12 fatalities since Saturday amid travel chaos and school closures. The polar vortex is a mass of freezing air which usually hovers around the Arctic. But thanks to weakening jet streams that usually keep the cold air contained, North Americans have been blasted with streams of cold Arctic air. Snow squalls have ripped through New York, Philadelphia and other cities, bringing near-whiteout conditions. The cold snap has claimed a number of lives, including a University of Iowa student found outside a campus building on Wednesday. The same day, a 70-year-old man was found dead on a street in Detroit. Other weather-related deaths have been reported as far afield as Indiana, Illinois, Wisconsin and Minnesota. 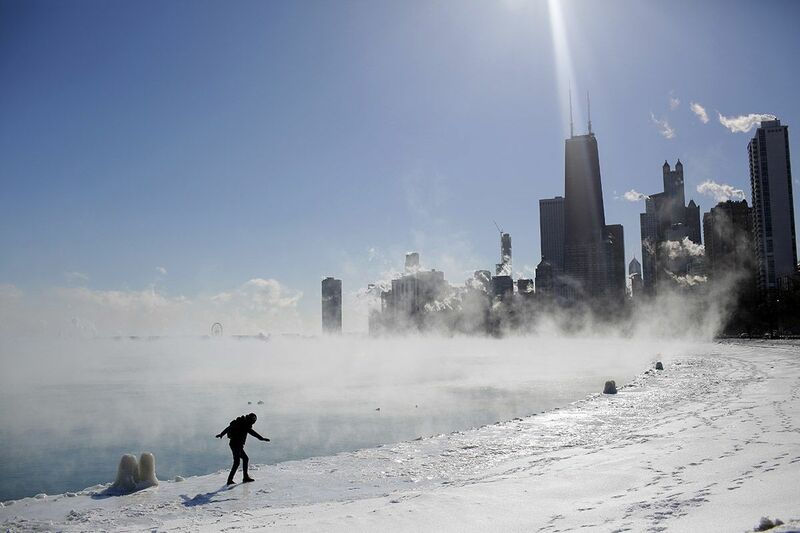 Residents of Chicago will be facing lows of minus 22 degrees Fahrenheit on Thursday, although sharp winds will make it seem colder. 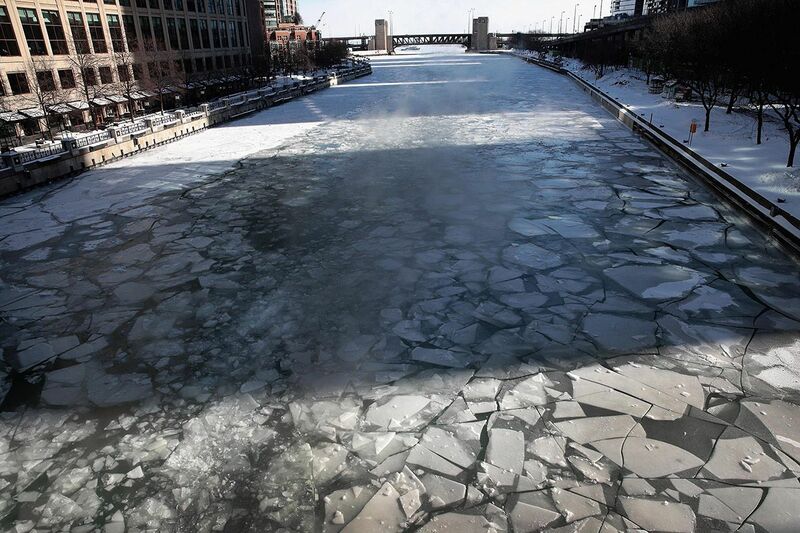 Much of the Chicago river has already frozen over, and over 4,000 flights were canceled on Wednesday and Thursday. Concern for the area’s homeless population continues. “I’m cold and I’m afraid,” a homeless Chicago man told The New York Times on Tuesday. “My feet are cold, and these clothes are all I’ve got.” Local government and homeless charities in Chicago have been setting up "warming centres" in community halls and CTA buses. 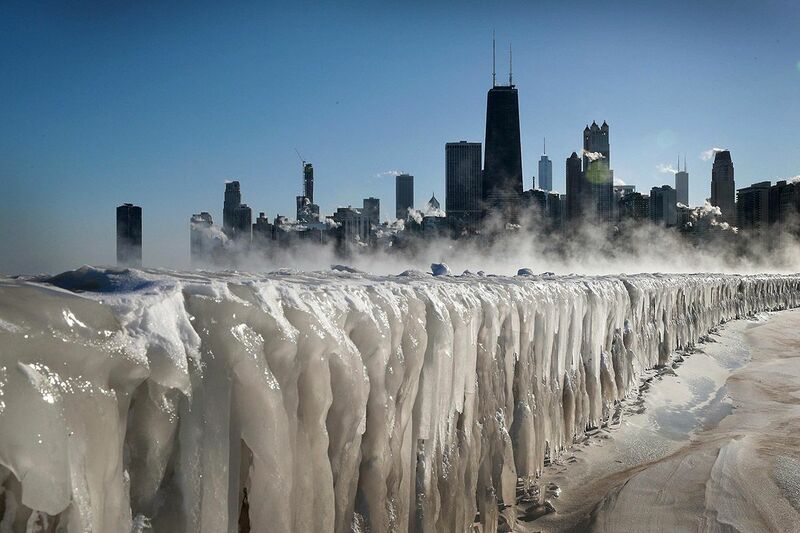 Schools in Chicago have been shut since Wednesday and all residents are warned to stay inside. 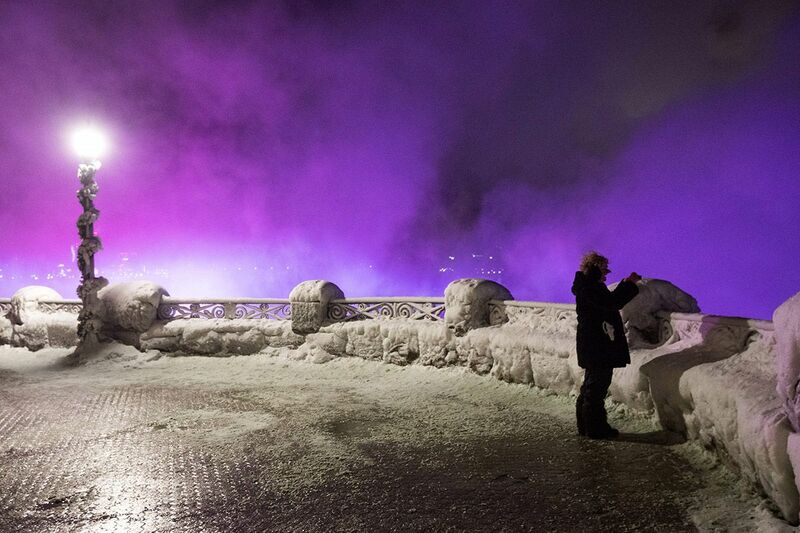 The city hasn’t experienced such temperatures since the record low of minus 27 F was set in 1985. Temperatures in Los Angeles felt 100 degrees warmer than in the Windy City on Wednesday morning, and Anchorage in Alaska was warmer than Jacksonville in Florida. On Tuesday, Boston reported seven days in a row of temperatures below 20 F, matching a record that was set 100 years ago. Minnesota has been experiencing temperatures cold enough to cause frostbite on exposed skin within minutes. In Illinois, 21 people stranded in a broken down bus were rescued by police from the sub-zero temperatures. 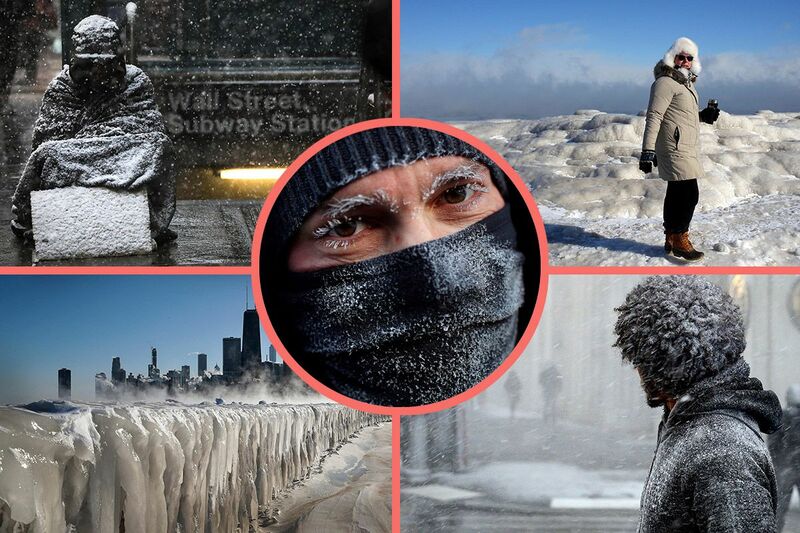 Newsweek has collected images that illustrate the extreme weather, from frozen eyebrows in Chicago to snow-caked pedestrians in New York. A man takes a picture of large icicles along the lakefront in Chicago, Illinois, as temperatures hovered around minus 20 degrees. A closer look at the large icicles that have formed along the Lake Michigan shoreline in Chicago. Ice covers the Chicago River in the Windy City. Ice covers the rainings and ground around the lookout point at Niagara Falls, Ontario, Canada. 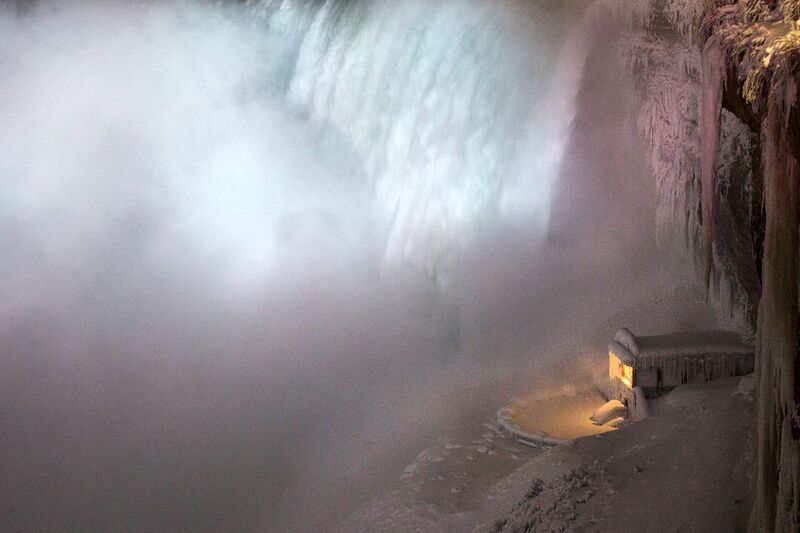 An observation point is covered in ice at the partly frozen Niagara Falls, Ontario, Canada. 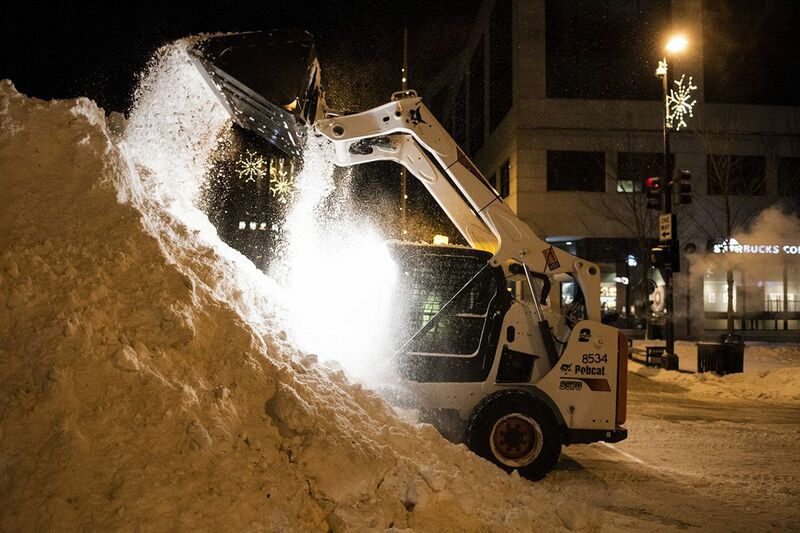 Snow is plowed on the streets of downtown Madison, Wisconsin. 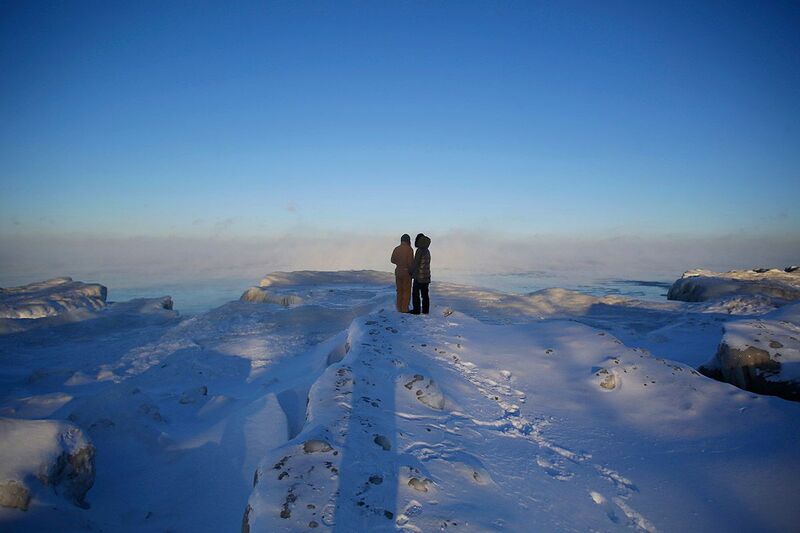 Ice formations cover Lake Michigan's shoreline in Chicago, Illinois. 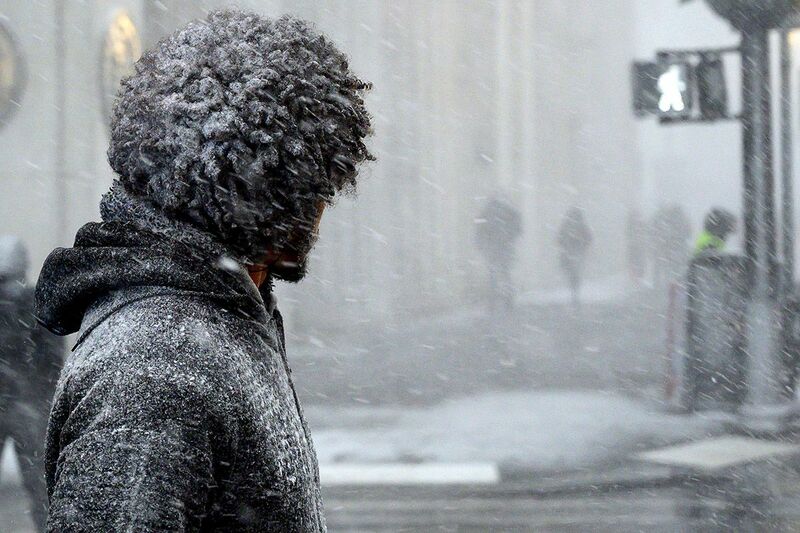 A man waits to cross a street as heavy snow falls in downtown Manhattan, New York City. 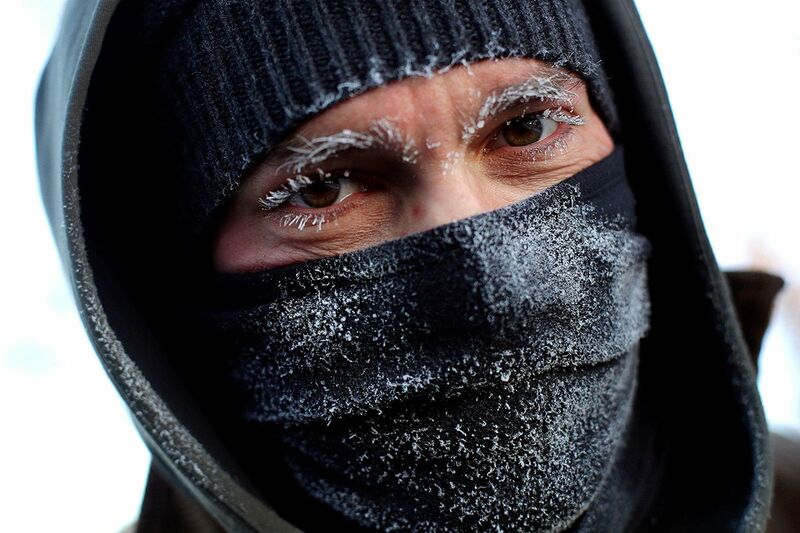 A man's eyebrows and eyelashes are coated in ice after walking along Lake Michigan's shoreline in Chicago, Illinois. 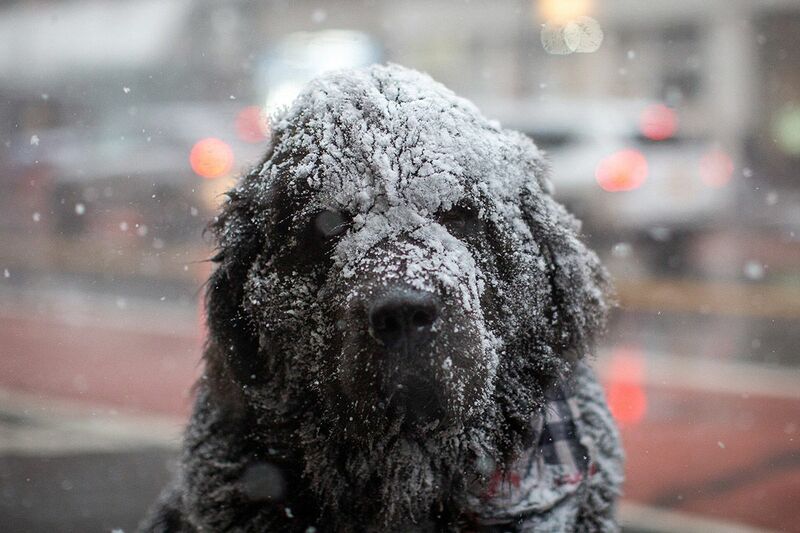 A Newfoundland dog sits on a bench as snow flurries hit Manhattan, New York. 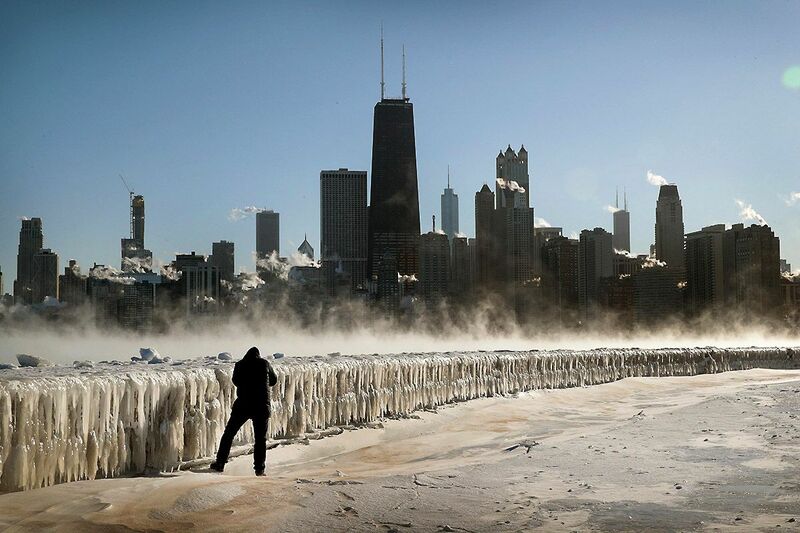 A man tries to keep his balance as he walks on the ice covering Lake Michigan's shore line in Chicago.